At KWC, we aim to be seamless. We want to achieve excellence in everything we manufacture. Our destiny is not to invent products, it is to perfect them. Achieving excellence in anything is a journey, a constant pursuit of perfection. For KWC, and the great Craftsmen we employ, this journey has led to our company being recognised as one of the finest makers of taps anywhere in the world. In the kitchen, we bring together three key factors for your benefit: comfort, ergonomics and functionality. 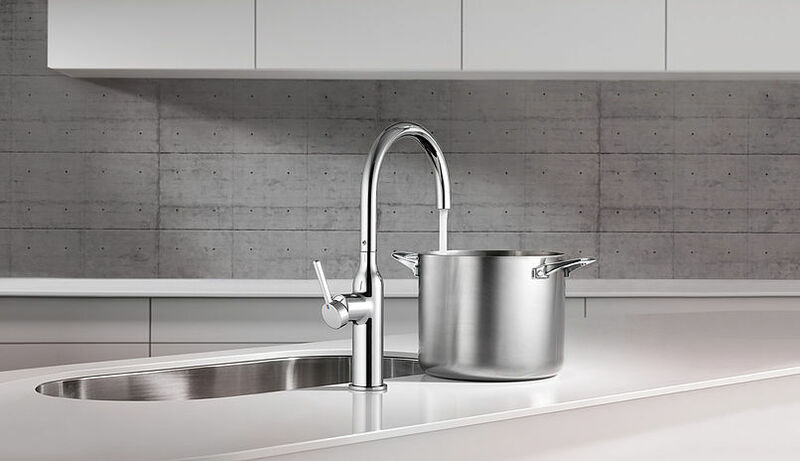 When it comes to our kitchen faucets, every detail is just right, every movement perfectly orchestrated and every function designed to impress. After all, our technology is not meant to make its presence felt, but to make itself useful – no matter whether you are cooking, cleaning or simply enjoying yourself. What are the top three things you need to guarantee long-term hygiene in your kitchen? Water, water and more water! 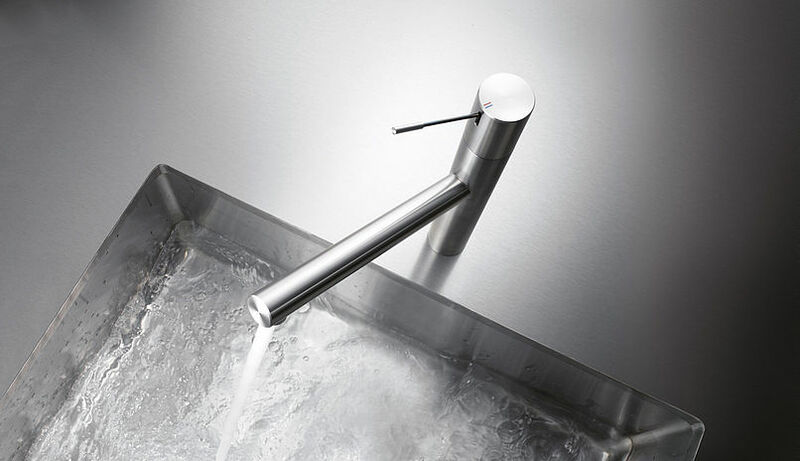 With our faucets, you can rest assured that you will always have running water at your disposal in just a few simple steps – anywhere you need it, in whatever quantity you want, at just the right temperature and with the perfect spray profile. The kitchen should be a place where you can work in comfort and feel at ease at the same time. Today’s home cooks like to prepare food, serve up dishes and add a few finishing flourishes with as much imagination as a master chef, and with ingredients that are as fresh as those you would find in gourmet restaurants. You want a kitchen you’ll absolutely love – whether you’re a professional aiming for Michelin stars or a keen amateur reaching for cookery books. 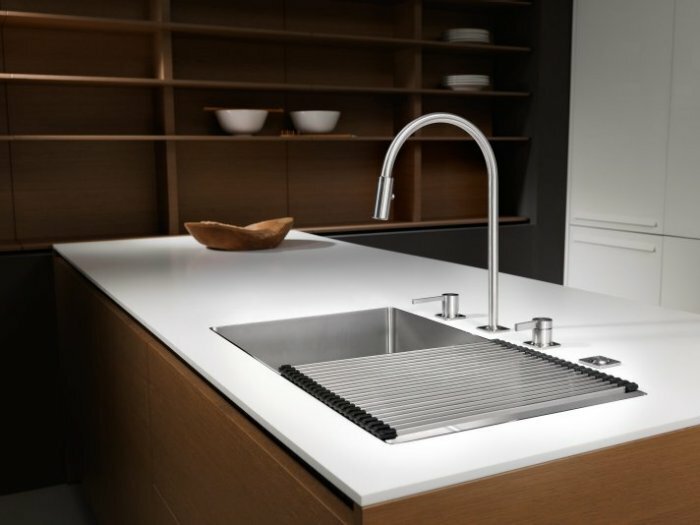 As a leading provider of professional faucets, we know exactly what you need from your contemporary sink and preparation area. With KWC ZOE, smart electronics and convenience have arrived in the kitchen. The sink provides the finishing touch to this avant-garde masterpiece. Special details: Teakwood cutting board, strainer insert, concealed drainage and elegant design solutions make the functional center a perfect symbiosis of technology, handicraft and design, a place where the creativity of cooking enthusiasts can truly unfold. 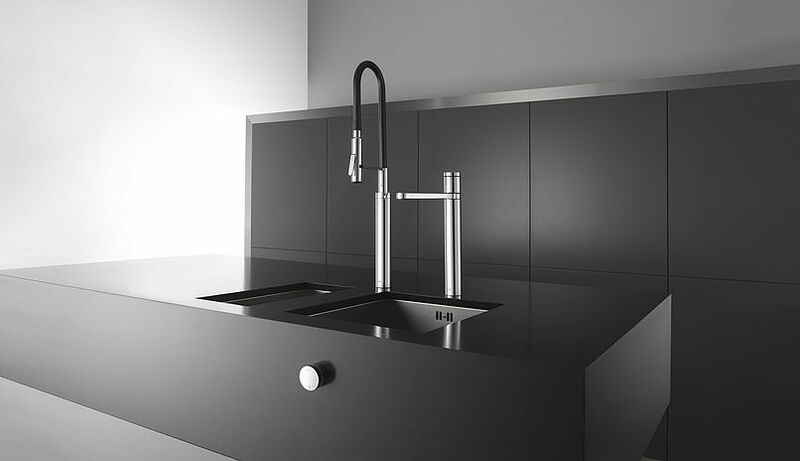 Reduced, lean and in absolute precision, KWC ERA embodies not only the perfection of sink & tap, but also defines an entirely new look – fully in line with a new minimalism. In a perfect finish and exclusive material mix of teak and stainless steel. 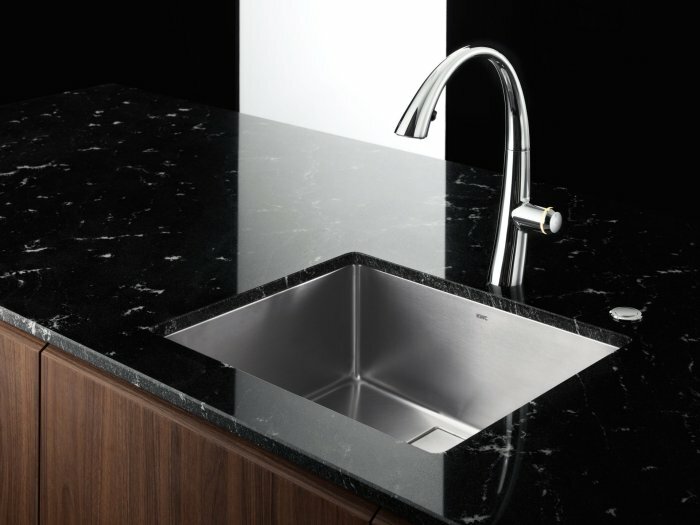 With the customized sink, the versatile classic KWC ONO has now achieved perfection. 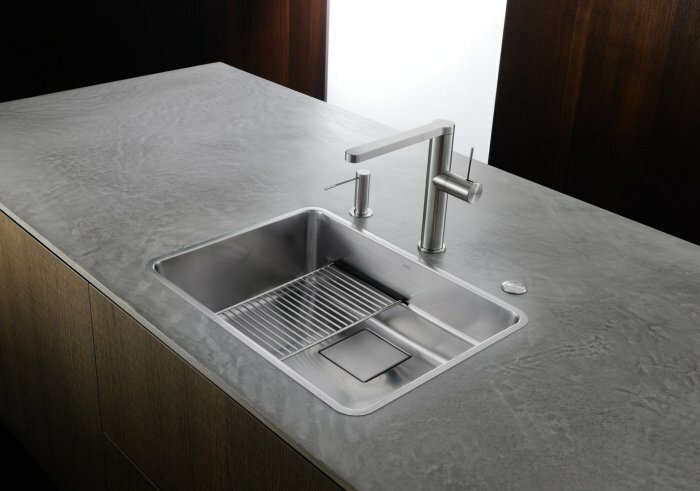 Just like the lever mixer, which is available in HighFlex finish and with various extraction variants and designs, the sink also opens up an enormous variety of options in harmony with individual working styles and utilization. Functional accessories provide new and additional working levels at three different heights. We pride ourselves through innovation, quality, design and sustainability and truly believe that our products reflect each of these attributes. Intelligent design culminating in excellent performance: KWC SwissSmartness embodies superior product design that makes perfection and elegance not only visible, but also tangible. Exceptional quality from A to Z: with KWC QualityControl, we guarantee the utmost product reliability. KWC performs and continuously monitors all stages of the process: development, production, installation, and even the manufacture of the required tools. Crafted with love, down to the last detail: KWC DetailPassion describes our legendary eye for subtle nuances and that special something. This valuable skill has made us a leading international supplier of superior quality taps that continue to raise the industry standard. Trust is good, certifications are better: our KWC CertificationGuarantee ensures that we have all of our products professionally inspected and certified across all markets. Designed for longevity: KWC TimelessDesign represents exacting aesthetic standards of elegance and perfection that are at once modern and timeless. A tradition of innovation: Our innate passion for challenging the status quo, optimising products and processes, and setting trends – that is KWC InnovationDrive. A unique spirit that has defined us since 1874.